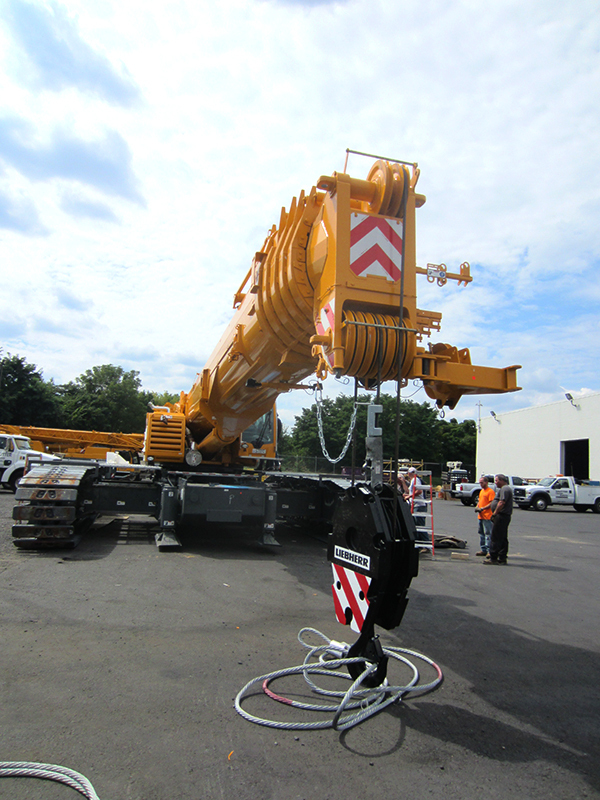 Sautter Crane’s 240ton LTR-1220 Liebherr Hydraulic Crawler installing tilt ups (concrete wall panels) in Deptford, NJ for the new Amazon warehouse. 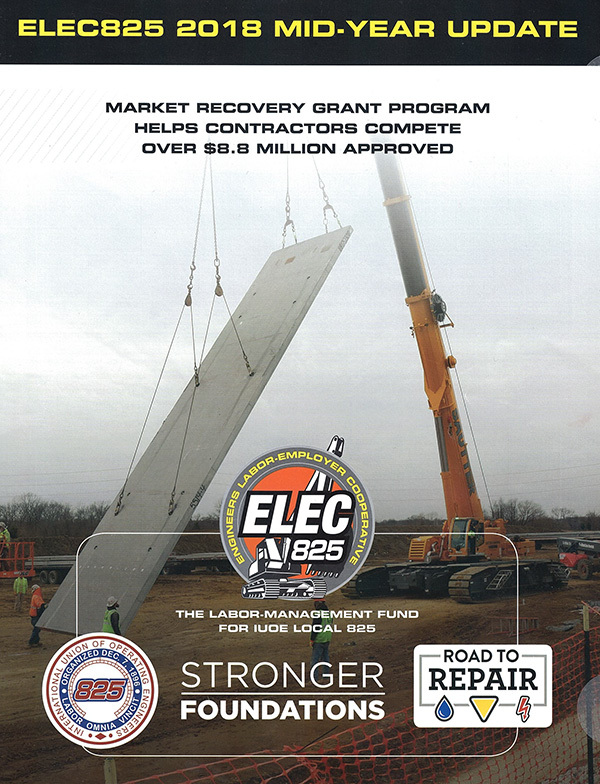 Image featured on the cover of the 2018 Mid-Year Update from the International Union of Operating Engineers. 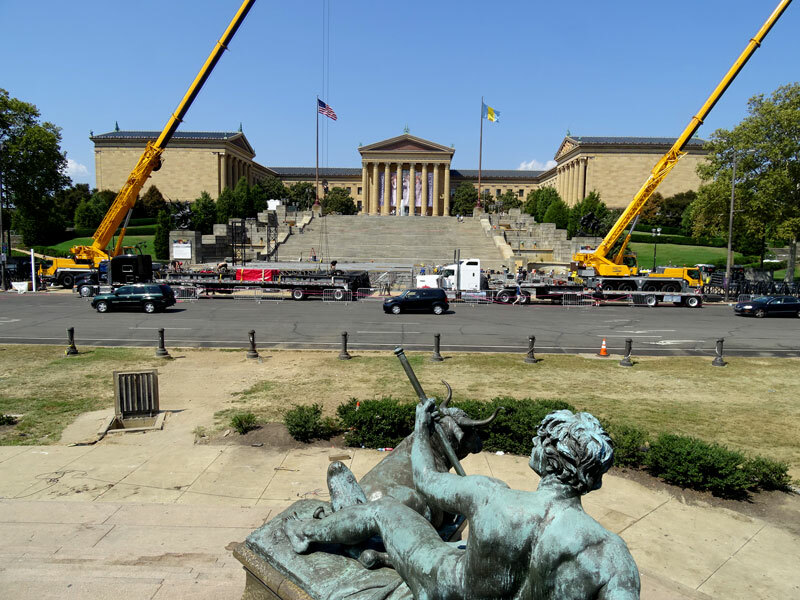 Thanks to positive reviews from its employees, Elliott-Lewis was named one of Philadelphia’s Top Work Placesagain this year, breaking into the Top Ten for Mid-Sized Companies for the first time. Elliott-Lewis is one of only 18 companies to have landed on the annual listing of best places to work every year since the programs’ inception 6 years ago. Read more about that here. 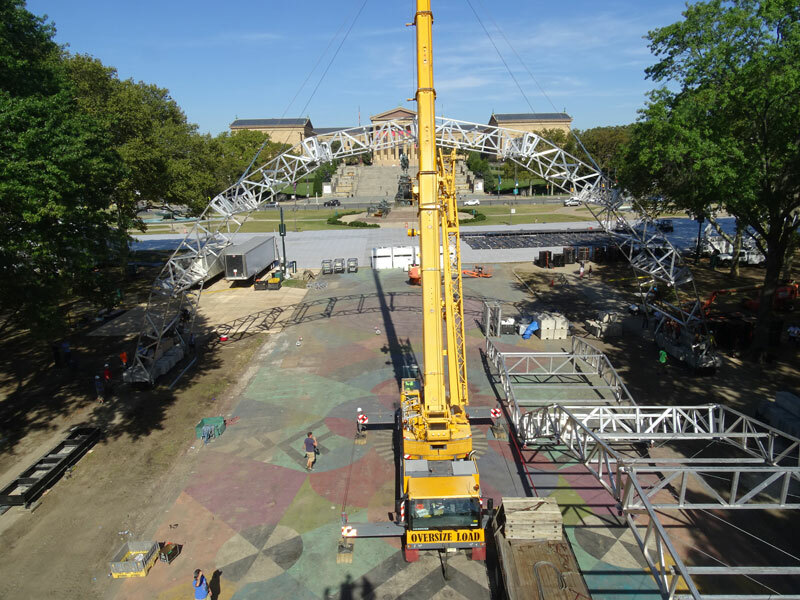 More than 35,000 employees were surveyed to determine this year’s results. 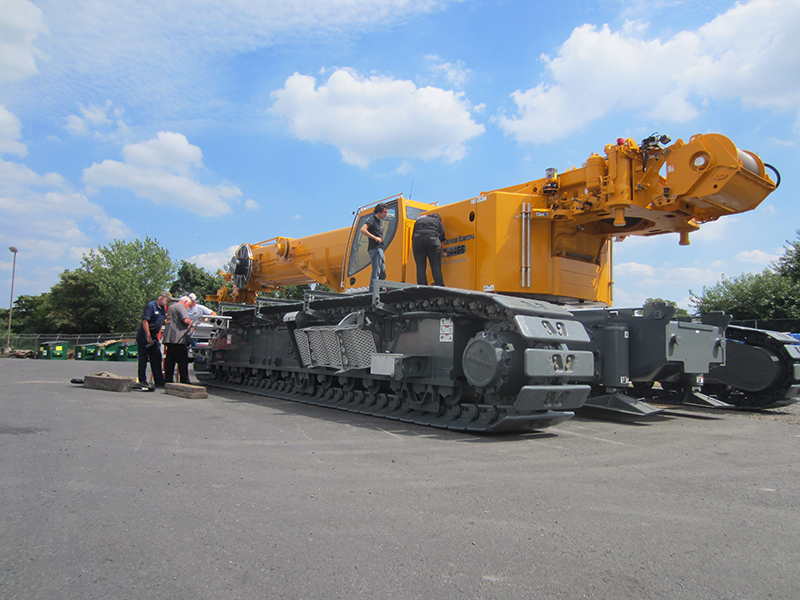 Read comments from our valued employees who voted us into the Top Ten. 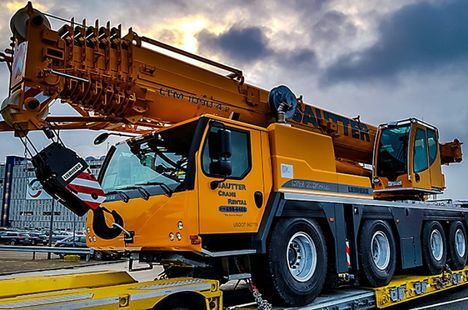 Employees from Sautter Crane and A A Duckett, Inc, part of the Elliott-Lewis Family of Companies, were included in the annual survey. A fuel tanker carrying 7,500 gallons of diesel fuel overturned on the ramp from Route 81 to Route 322 in Harrisburg on May 9, 2013. 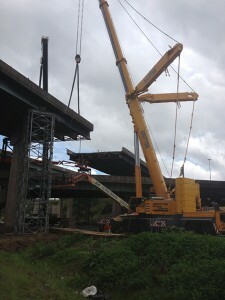 The resultant fire melted guide rails and the steel in the 322 bridge deck above the crash site. 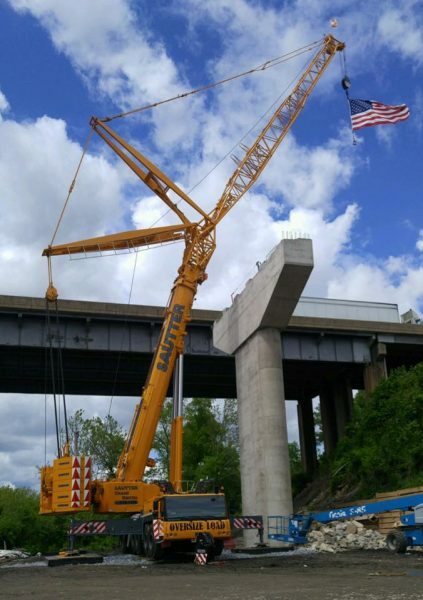 PennDOT’s emergency service contractor, J D Eckman Inc., called Sautter Crane, who dispatched two 500-ton Liebherr cranes to the site. The team worked round the clock in an effort to reopen Route 81 at Route 322/22, one of the busiest intersections in the state. The Governor signed a disaster emergency proclamation and asked non-essential government employees to stay home and schools in the area to close to try to relieve the massive traffic jams caused by the road closures. While Route 81 should reopen shortly, repairs to Route 322 are expected to take two months. 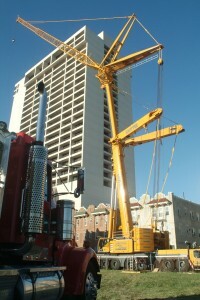 Sautter Crane's Liebherr LTM1400 7.1 in action at an equipment lift at The Enclave, 3851 Boardwalk, Atlantic City, NJ. 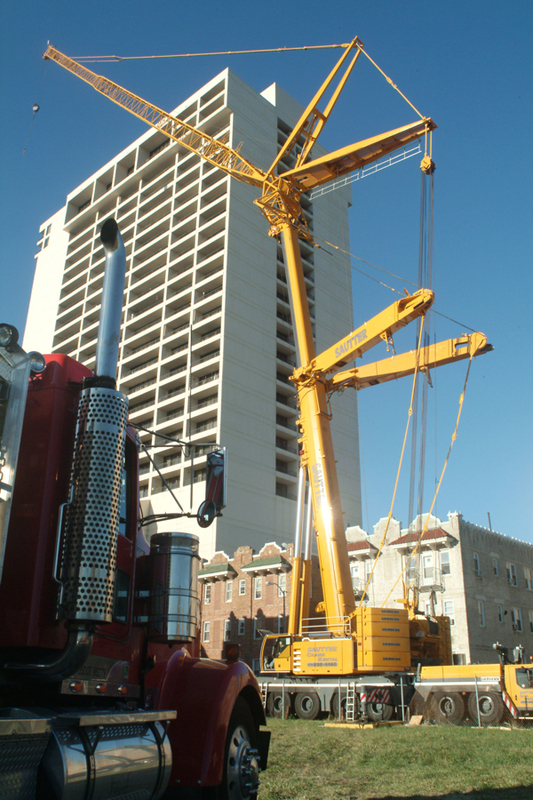 “Liebherr makes the finest crane on the market; they are the Bentley of cranes,” said Bob Sautter, president of Sautter Crane. 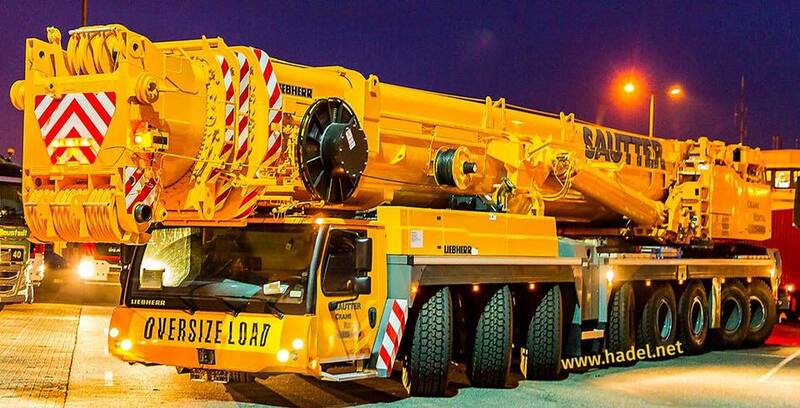 We think the extra investment they require pays off over the life of the crane and in the reliability we can offer our clients.” Sautter has Liebherr Cranes in its fleet ranging from the new 70-ton up to its 300 and 500-ton cranes.